A parts director for a large Chrysler vendor this week criticized PartsTrader’s new 1.75-3.5 percent fees on every transaction, saying that they would wipe out already low margins. Marvin Windham of Benchmark Chrysler Dodge Jeep Ram gave the example of a wholesaler who’s selling parts to shops/insurers at a 30 percent discount from MSRP and clearing 5 percent of sales net after expenses. If you take the average OEM repair parts cost, slickly compiled from Audatex/Property Casualty Insurers Association of America data in this 2014 WPRI interactive, you can see his point. Take an average OEM parts cost of $678 as the sale price. The supplier sells parts to an auto body shop at $474.60. His net profits are 5 percent of sales, or $23.73. But if the shop “retailer” charges the insurer the $678, PartsTrader charges the supplier 3.5 percent of it — which is also $23.73. If he doesn’t raise prices to shops, he’s not profitable. Now, that’d mean the shop marked up the product 43 percent to reach the $678. What if the shop only marked it up 25 percent to $593.25? PartsTrader would take $20.76. The supplier is now ahead $2.97 — 1 percent of sales. “They’re getting all the profit,” Windham said. Worse, according to Windham, PartsTrader said his sell-through rate was only 29 percent, which meant that “71 percent of the work we do, we don’t get paid anything.” And the time spent on those failed sales was even longer than ideal, Windham said, because his staff has to verify parts numbers in many cases. “PartsTrader’s just killing us on productivity,” he said. Well, win some, lose some, right? Isn’t that always the gamble when you bid for business? Plus, Chrysler offered the option — although it entailed a bit of a process for wholesalers — to match aftermarket prices in some cases. With PartsTrader, that wasn’t an option, and the aftermarket and recycled parts are at an advantage if insurers base part decisions solely on price. This system would “force dealers to start eating other dealers,” Windham predicted. “That’s what people are already doing,” he said. It also opened the door for businesses to troll quotes and offer a deal as a loss leader. PartsTrader has said repairers must, under its Terms of Service, order any parts whose price they found on PartsTrader through that platform. “PartsTrader cannot solely be used as a sourcing tool,” business development Vice President Dale Sailer wrote in an email. That theoretically also prevents suppliers from using PartsTrader only for State Farm sales — which carry no fee — and bidding on other insurers’ prices on the side, according to Sailer. PartsTrader also had a role in 12 percent of sales (State Farm’s market share was about 19 percent in 2013, in case you were wondering), which means a repairer who didn’t use the service might be leaving millions on the table, according to Sailer. “Since entering the parts procurement market in 2012, PartsTrader has made steady progress in delivering real value to dealers like yourself,” Cooper wrote. PartsTrader 3.0 does upgrade some features for suppliers. New filters will allow them to ignore requests for parts they don’t sell — as well as see chances for growth with parts no one else is selling either — and track staff performance and employee bidding. Quoting with one’s actual inventory integrated into PartsTrader will also eventually expand to integrating the DMI platform of OEM suppliers. 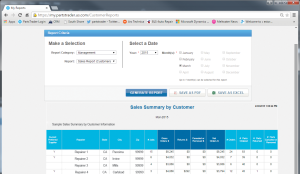 Also, suppliers will now be able to track customers by returns percentage and amount, as well as net sales. Windham argued that PartsTrader has interjected itself into an unnecessary role as a middleman without adding any value for OEM dealerships, whom the company will now charge 1.75 percent to sell to their own body shops. OE Connection at least verified parts numbers for its subscription fee, he said. Plus, even the more archaic “call-and-fax” system could be handled electronically — there’s eFax, after all, he said. Windham said he didn’t know of any other electronic parts procurement system that charged a transaction fee. However, Sailer said the system wasn’t priced out of the market with the new costs. “We only charge our suppliers when we integrate with them and provide additional value by eliminating many of their manual processes such as quoting, order placement, invoicing, shipment notification, etc.,” he continued.